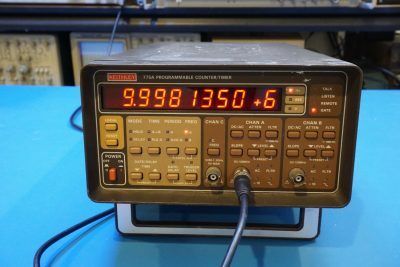 I just picked up a Keithley 775A programmable frequency counter from eBay. 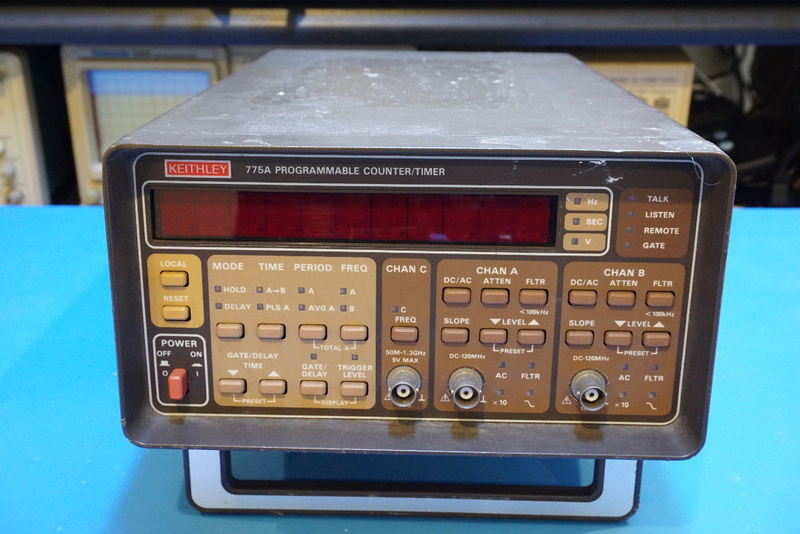 Specification-wise, this counter is very similar to the Racal Dana 1992 frequency counter I repaired last year. 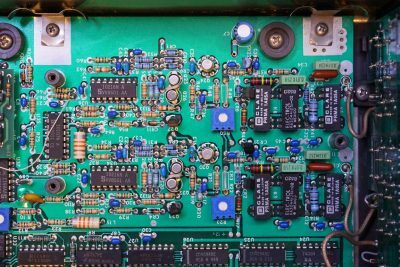 The Keithley 775A I got came with an additional channel (option 7751) and is capable of measuring frequencies up to 1.3 GHz. Like the Racal Dana 1992 frequency counter, the Keithley 775A was also made in roughly the same era, back in the mid-80’s. 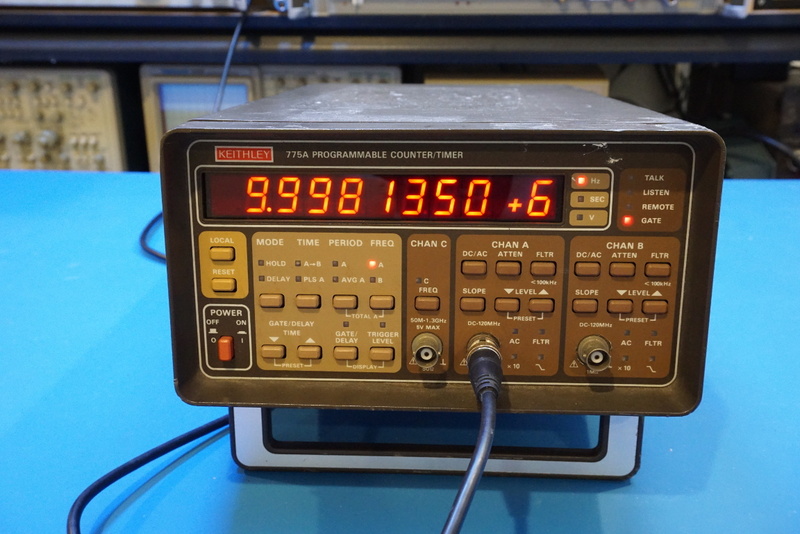 In fact the specifications for these two frequency counters are very comparable with the Racal Dana 1992 slightly edging out in channel frequency coverage and sensitivity. 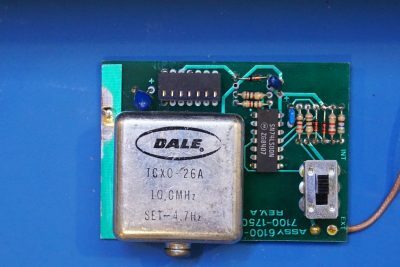 Like the Racal Dana 1992, the Keithley 775A also has two channels that are designated for measuring lower frequencies (up to 120MHz for the Keithley 775A). 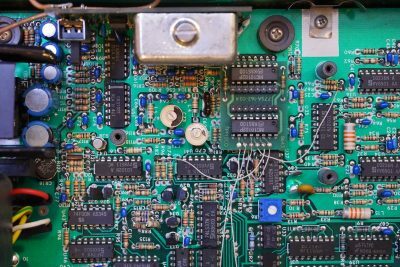 At the first glance, the overall circuitry is much simpler in the Keithley 775A compared to that of Racal Dana 1992 as the latter has an additional PCB besides the main circuit board at the bottom. A large portion of the circuitry for channel A and channel B operation is covered under an aluminum shielding. 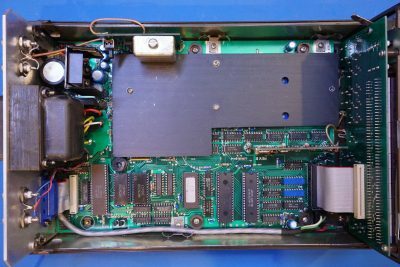 The uncovered portion consists of the main processor unit and the circuitry for driving the GPIB. 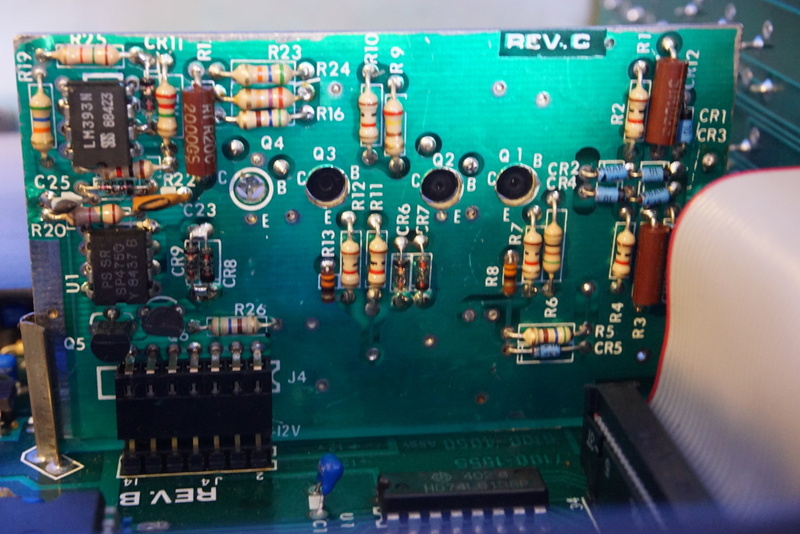 Next to the linear regulator section of the board lies the riser board for the TCXO option which this unit comes with. Unlike an oven controlled crystal oscillator, a TCXO does not use oven but rather senses the environmental temperature changes and compensates the oscillator circuit accordingly. Thus the frequency stability of an TCXO is not as good as that of an OCXO. The GPIB communication is handled by an Intel 8291A GPIB controller. 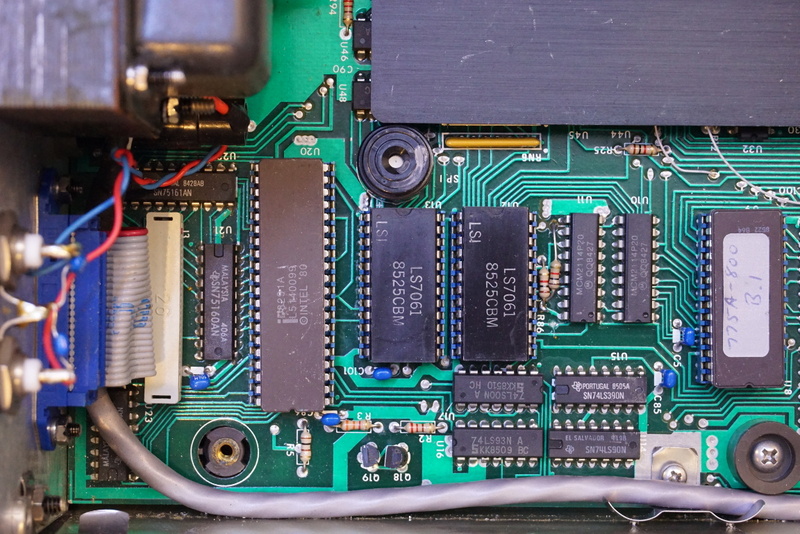 And the two chips located next to the GPIB controller are LS7061‘s which are dual 16-bit counters. 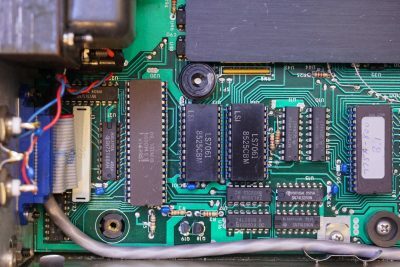 The firmware is stored in a 2674 EPROM. 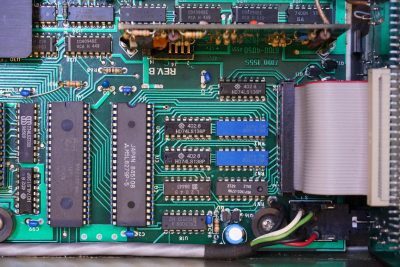 The main processor used is an MAB8031A processor, which is essentially a ROM-less 8051. the display and keyboard logic on the front panel are handled by an M5L8279P-5 programmable keyboard/display interface chip. Underneath the aluminum shielding cover are the circuitry for channel A and channel B. 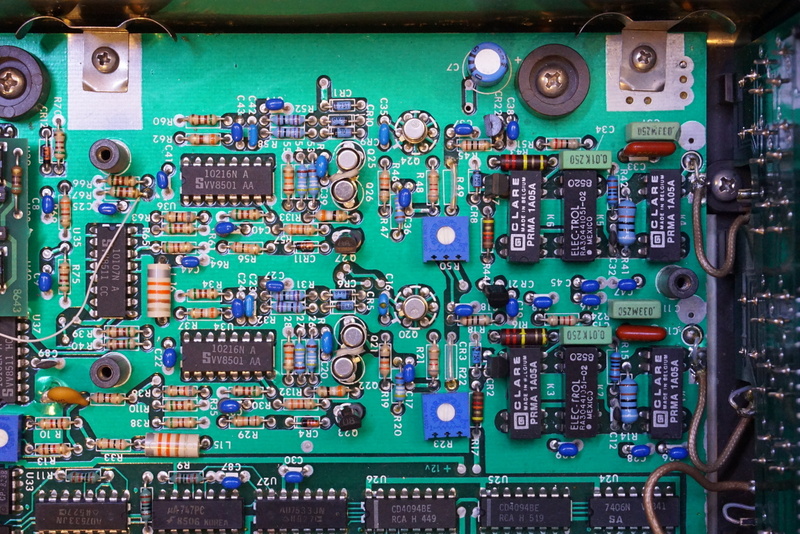 In Keithley 775A, the performance of these two channels are identical and thus it is not surprising to see the identical circuitry for these two channels. The daughter board layout shown in the picture below is very interesting. 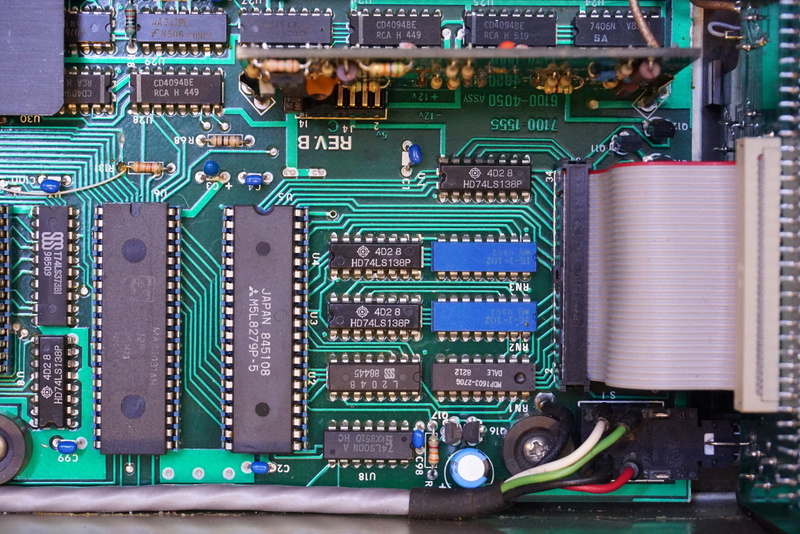 Although only a single MC10102P quad two-input NOR gate was listed in the circuit diagram in the service manual, two are mounted on a daughter board which plugs into the original IC socket. And for whatever reason, loose wires were used to make point-to-point connections from the daughter board to the rest of the circuit on the main board. Had this not be a Keithley instrument, I would have doubted the doubted the intention of this bodge. This Keithley 775A also comes with the channel C option and this option is added via an added-on daughter board. Surprisingly enough, this board is not shielded even though the channel is handling frequencies up to 1.3 GHz. 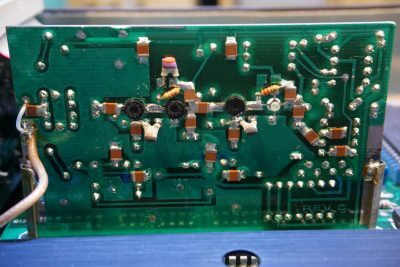 From the other side of the channel C PCB, you can see four high frequency transistors used for signal pre-amplification and conditioning. 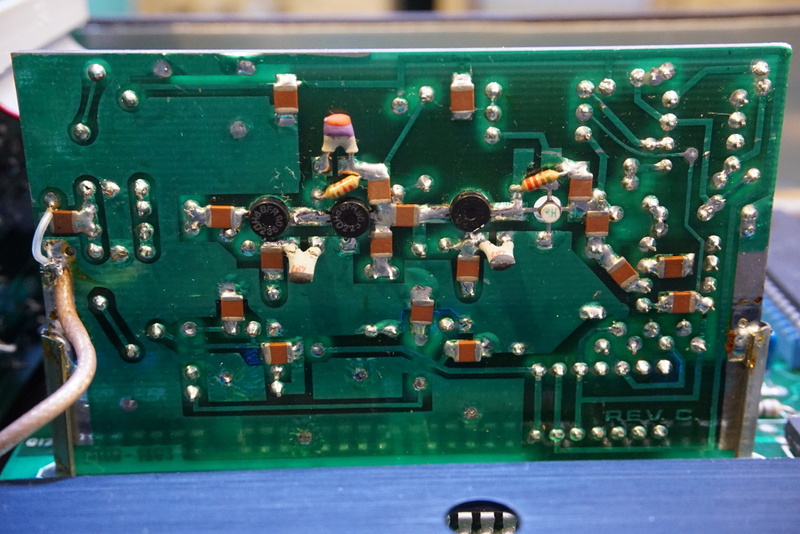 While using my Rubidium disciplined 10 MHz reference to test the accuracy of this frequency counter, I discovered that the TCXO is slightly out of tolerance and I could not adjust it to be precisely 10 MHz. I will likely need to investigate this further.